Dave was bragging to his boss one day, “I’m telling you, I know everyone there is to know. His boss was tired of hearing him boast and decides to call his bluff. Although impressed, Dave’s boss is still sceptical. 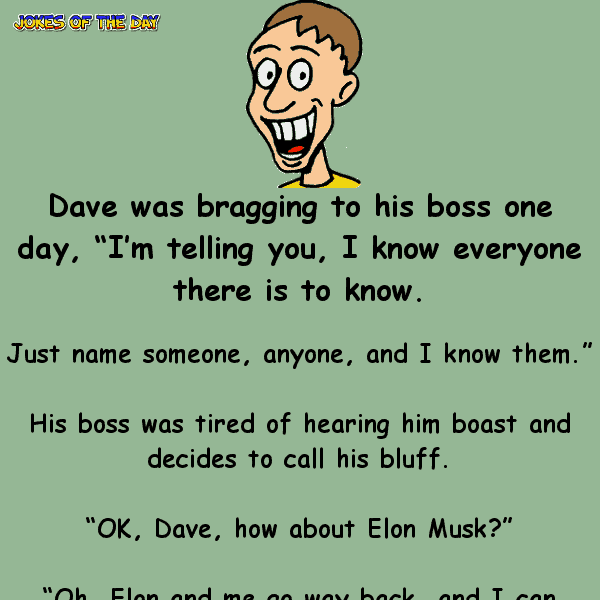 After they leave Musk’s house, he tells Dave that he thinks him knowing Elon was just lucky. “Bill Gates,” his boss quickly retorts. “Yup,” Dave says, “Bill and I are old buddies. Let’s fly out to California,” and off they go. Well, the boss is very shaken by now but still not totally convinced. After they leave the Microsoft offices, he expresses his doubts to Dave, who again asks him to name anyone else. Dave and his boss are assembled with the masses at the Vatican’s St. Peter’s Square when Dave says, “This will never work. I can’t catch the Pope’s eye among all these people. Tell you what, I know all the guards so let me just go upstairs and I’ll come out on the balcony with the Pope.” He disappears into the crowd, headed towards the Vatican.